After the cruel tease of morning sunlight followed by yet another rainy May afternoon, I'd wager that you're eager for a little Monday afternoon escapism to balance the karmic scales. We've got just what the doctor ordered with a pair of videos from Free Pizza and Teleman. Free Pizza is a Nashville-based postmodern band formed in Boston's DIY scene by a pair of South American guys raised in Miami? Got all that? From the caffeinated, 80-influenced guitar riff, to the slightly ragged speak-singing, this video inspires, nay, commands you to shake it like nobody's watching (or, like you're having some kind of fit). The song, appropriately, is titled "Dancing". Their sophomore effort, Berlin, DE, is out June 17 on BUFU Records. 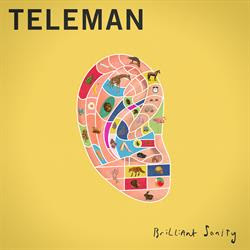 You might remember Teleman from our Tubesday feature a few months ago. They're out with the video for their newest single "Glory Hallelujah", the latest from their album Brilliant Sanity. The video is a heart rate-elevating piece of revivalist tent power pop glory, clad in a technicolor dreamcoat of hues. Brilliant Sanity came out last month on Moshi Moshi.